Who should not take Methadone HCL Tablet, Soluble? What conditions does Methadone HCL Tablet, Soluble treat? Get medical help right away if you have any rare but seriousseizure, unusual drowsiness/difficulty waking up. List Methadone HCL Tablet, Soluble side effects by likelihood and severity. What should I know regarding pregnancy, nursing and administering Methadone HCL Tablet, Soluble to children or the elderly? The risk of serious side effects (such as slow/shallow breathing, severe drowsiness/dizziness) may be increased if this medication is taken with other products that may also affect breathing or cause drowsiness. Therefore, tell your doctor or pharmacist if you are taking other products such as alcohol, marijuana, allergy or cough-and-cold products, medicine for sleep or anxiety (such as alprazolam, diazepam, zolpidem), muscle relaxants, and psychiatric medicines (such as risperidone, amitriptyline, trazodone). Your medications or doses of your medications may need to be changed. Does Methadone HCL Tablet, Soluble interact with other medications? Should I avoid certain foods while taking Methadone HCL Tablet, Soluble? 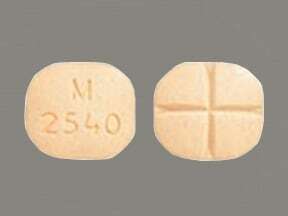 This medicine is a orange, rectangular (rounded end), double-scored, orange, tablet imprinted with "M 2540". Are you taking Methadone HCL Tablet, Soluble? Are you considering switching to Methadone HCL Tablet, Soluble? How long have you been taking Methadone HCL Tablet, Soluble?